In the photo it may appear I attempted a seductive New Years Outfit but no, my shirt was torn by handcuffs. I was just tackled in a the Barcelona airport by the security guards. What? What did I even just write?! This is not the kind of stuff that I’d expect to happen to me. I am a middle class woman with zero police history of any kind. I wasn’t even in any fistfights as a teenager or child. I don’t watch scary movies because I don’t like violence. And until i was a teenager, I considered Aladdin a scary movie and Fern Gully of the horror genre (to be avoided at all costs). So that makes what happened to me a few hours ago even crazier. 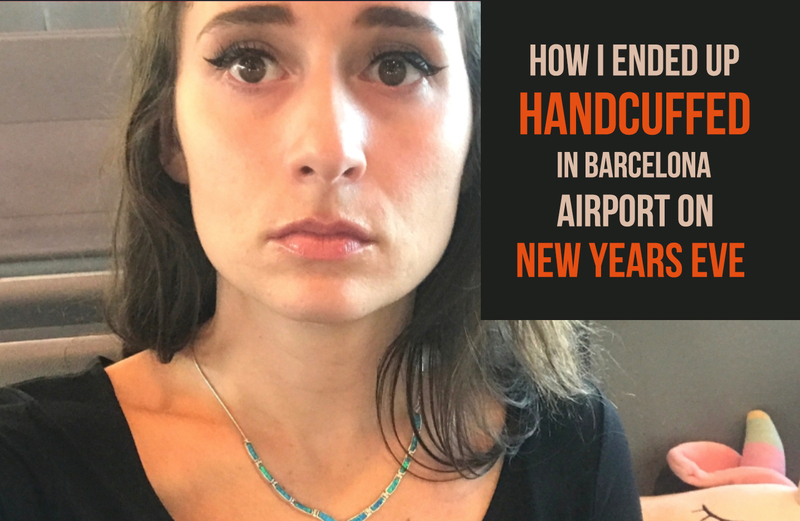 I was pushed, grabbed at, handcuffed, and shoved to the ground by both a young male and older female “security guards” at the Barcelona airport. I was unarmed and didn’t touch either of them. 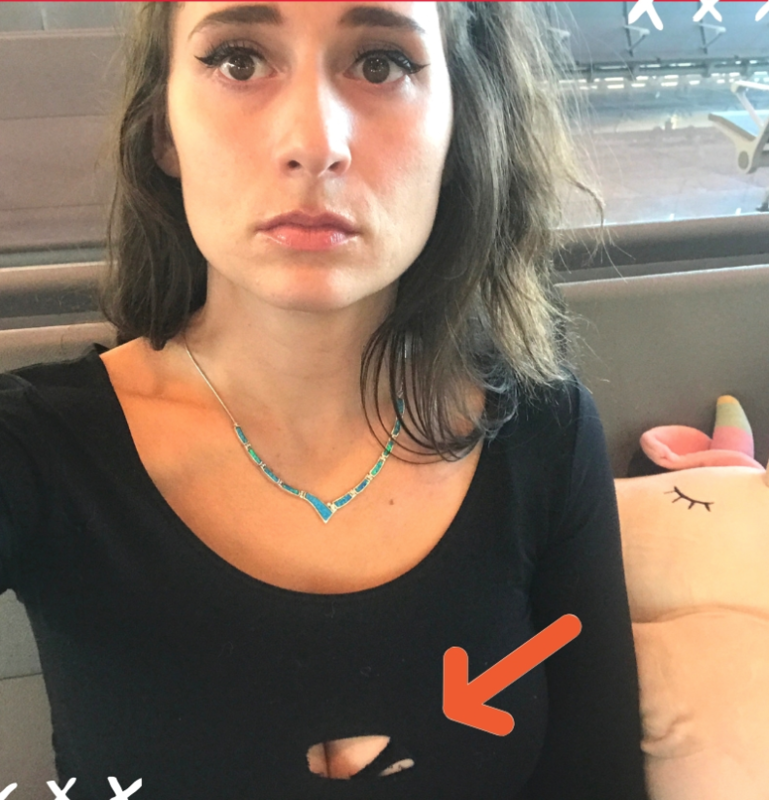 My shirt was ripped open and my hand crushed. The man “security guard” tried to arrest me because I was holding my phone filming. [EDIT* FILMING AFTER HE GRABBED MY BREAST AND KEPT HARASSING US PHYSICALLY AND VERBALLY. I started filming because i got scared of what he would do so I knew I needed it on camera to protect myself. To people who say its not legal to film in airports, I say that after an officer of the law touches my body I will film to protect myself. He put on gloves, and prepared his handcuffs and scraped them across my body on my chest, ripping open my shirt as I screamed. I was screaming like I’ve never screamed before. And literally no one, no passer by’s and no other airport employees did ANYTHING. No one even SAID ANYTHING. They just watched. It was unbelievable. No “Hey what are you doing! What’s going on!” It was so scary. Because imagine if this was happening with the security or police on a back street with no bystanders, no security cameras. Imagine what these types of people would do. 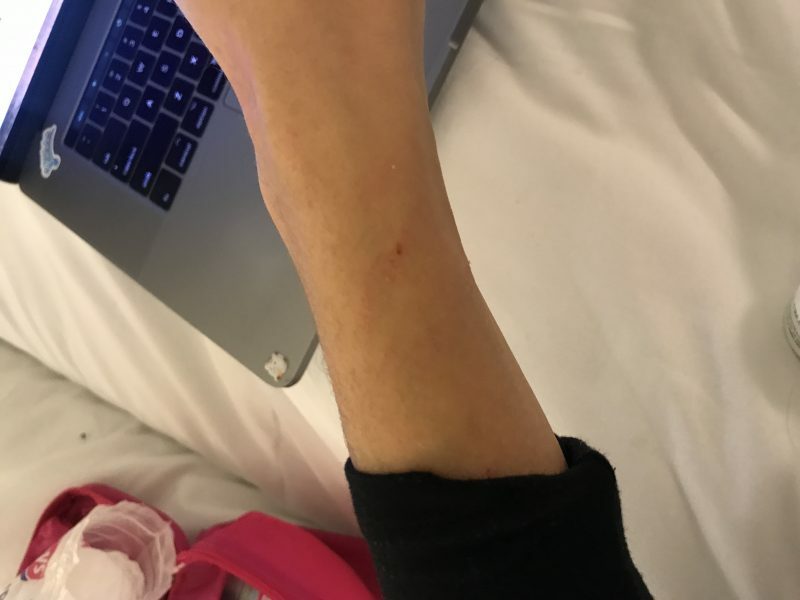 Scratches on my wrist from the handcuffs. Not a sentence I ever thought I’d ever write but here we are. (Sorry they’re blurry it’s dark in the room and I took a screenshot of the photo). But after being assaulted by two trained licensed security guards… now I’m not so sure. After it happened, their supervisor came. I tried to tell him what happened and even with my ripped clothing he was on their side. He did not believe me. “I’ve known her for 8 years, that could not have happened.” He kept saying he’d watch the cameras and I said PLEASE, watch the cameras. We went 2 hours early to check in for our flight and get some work done. There was a problem with the tickets because Malta Airlines had generously tried to surprise us with an upgrade for one leg of our trip, from Barcelona to Frankfurt. The problem was, the other leg was now null. So Nuseir tried to take care of it, calling Malta and having them speak with our Lufthansa desk agent (who was lovely). The customer service people on the phone got impatient and were rude to her. We could hear them through the phone. The woman got flustered and stressed and upset, and it triggered “the monster”. The monster was a bald small middle aged male employee who heard her phone call and decided it was all our fault. Long story short he trundled over to her desk, told her that she shouldn’t help us, and blamed us for the workers on the phone for being rude. Workers that we were 0% connected to. We had also felt bad for the lady, so why was he taking it out on us, and in such a vindictive way? I literally don’t know. We had been completely normal and chill the whole time. He started saying things like “If you say another word I’ll make SURE you don’t get on your flight” and “I have the power to stop you from boarding”. Like it felt like a dramatic movie and he was reading from a script but to the wrong audience. He hit a button to call security and we assumed when security came they’d be upset with him for calling them for no reason. Unfortunately that was not the case. Instead they barrelled up, already aggressive, assuming we were guilty of something?? And told us VERY AGGRESSIVELY to leave the airport. We were like…what is going on here. We finally got our boarding passes and walked away. Nuseir turned to take a photo of the desk and what happened and they saw him and ran at us, yelling and trying to take his photo, threatening him and being crazy in general. He shouldn’t have taken a photo because it was so high blood levels already, but even more importantly they shouldn’t have lost their minds because of a photo. A simple professional “Hey, we don’t allow photos here can you please delete that?” would have sufficed. But they were aggressive, physically intimidating us and verbally threatening, until the male pushed Nas even after he deleted the picture per his request. I got so angry and scared, a security guard was pushing us? The protector was pushing us? In the US everyone knows…NO physical contact unless its self defence. I started defending Nas and the guy started to come at me, so I stepped back and he stepped up to me and pushed my shoulder trying to take my phone (which I hadn’t done anything with). I got scared and told him DO NOT TOUCH ME DO NOT TOUCH MY CHEST and he grabbed my breast and gave me a malicious look. The look that said “I’m a security guard I’m the boss and I’ll grab your breast if I want to.” I almost didn’t want to mention this part because compared to being tackled to the ground by two people trying to handcuff me it doesn’t seem as important. But it’s so so scary. This is not a safe world for us. This is Spain, not the wild west. When we handed them our boarding passes at the gate, we found out the mean desk agent had contacted the gate and told them not to let us board the flight. After all this they wouldn’t let us on. Luckily these agents were nice and we spent an hour explaining everything to them and they listened and believed us. We didn’t have time to report it to the police because hours had been wasted and the guys needed to go make the video for the day. We booked an airport hotel and this is where we are spending new years (instead of in a lovely suite with the team at the Hilton in Malta – so sorry we couldn’t make it!). It would have been nice to be in Malta where I feel safer and taken care of but that’s life. I’m of course grateful nothing worse happened but I feel so sad for the people it does happen to. I asked the tapes to be reviewed so hopefully at least the male worker will be fired. He had only worked there 1 month. The woman on the other hand I’m sure will stay in her position. Another threatening mean spirited person with power. Wow. That was long! And this was my “abbreviated version”. GOODNIGHT MY SWEETS. LOVE U. AND DONT WORRY ABOUT ME I’M FINE. Just…I guess be careful and aware out there, and have a safe New Year’s Eve! We’ll be sleeping a few hours then catching a new morning flight that I really hope goes smoothly. Thank you for being awesome friends and readers and people. I’m not mad at the airlines or the airport. I’m just disappointed that people get away with these things and that they happen. Just wanted to share this as a record of what’s going on since I wasn’t able to make a police report. Hope this doesn’t get you down, it’s not meant to! Just information. HAVE A LOVELY DAY! ADIOS!